I was so delighted to get involved with the national convention of the Sri Lanka Association for the Advancement of Quality and Productivity (SLAAQP) with the fitting theme, “National Prosperity through World Class Quality and Productivity”. 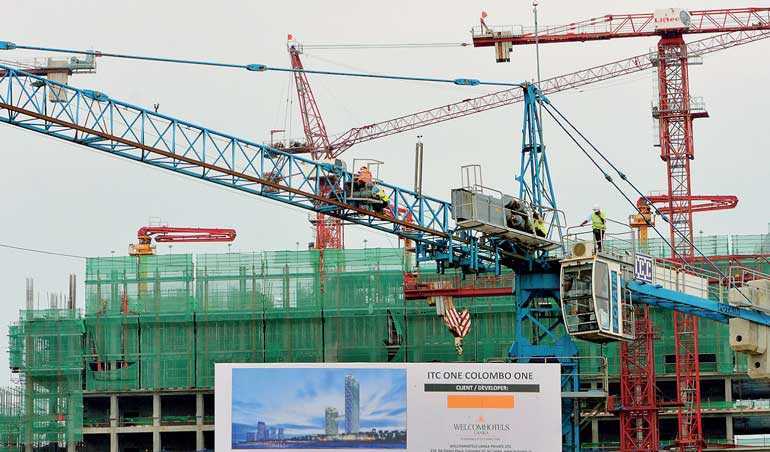 It was held last week in Colombo with a record participation of more than 1500 members of “quality circles” who represented the Sri Lankan labour force. Speaker of the Parliament Karu Jayasuriya was the Chief Guest and I was the key note speaker. Today’s column is a glimpse of what it highlighted, in terms of the relevance of quality and productivity for national prosperity. National prosperity encompasses a variety of aspects including economic development, social wellbeing, environmental protection and peaceful co-existence. Both public sector administrators and private sector managers have a crucial role to play in such a mammoth endeavour. The world class best practices related to quality and productivity could be our “next” practices in moving towards prosperity. It reminds me of what Franklin D. Roosevelt said a long time ago: “The point in history at which we stand is full of promise and danger. The world will either move forward toward unity and widely shared prosperity - or it will move apart.” It is, in fact, relevant and significant to us Sri Lankans, considering the juncture we are in with regards to the needed peace, prosperity and progress as a nation. As we are much aware, quality refers to the degree of excellence associated with something or someone. It involves a set of distinctive attributes or characteristics that sets a standard or a benchmark. Productivity on the other hand is the combination of efficiency and effectiveness. It deals with how efficiently one uses resources and how effectively one achieves results. Quality and productivity often go hand in hand as inseparable dimensions of excellence. Sri Lanka Association for the Advancement of Quality and Productivity (SLAAQP) was founded in 1996 and was the successor to the Quality Circle Association of Sri Lanka, which had been established in 1989. Since then the association has immensely contributed to the quality and productivity of our nation. SLAAQP is a non-profitmaking organisation comprised of professionals those who wish to contribute their time and knowledge to uplift the quality and productivity in our country. Among the key events of SLAAQP, the annual National Convention of Quality and Productivity occupies a prominent place. In addition, they conduct an annual 5S convention and further extends services to the industry by holding public seminars and tailor made in-house training programs. Hence, productivity promotion in the private sector, public sector, education sector and community sector is being achieved through establishing a productive work culture within the country, encouraging innovation and creativity, launching an awareness program to the general public, and socialising the program on productivity promotion as a national campaign. What was so amazing is the fact that the young and vibrant workforce, instead of engaging in destructive actions through extreme unions, have come forward through quality and productivity initiatives to have many constructive initiatives. SLAAQP hopes by enhancing quality and productivity to provide benefits to consumers/workers in improving the standard of living, to business by creating more impact and the Government by generating larger tax payments by higher economic growth. Performance has always been a buzz word in relation to quality and productivity. It matters for both private and public sectors alike. What is performance? The dictionary meaning is that it is the execution or accomplishment of work. Moving beyond, it can also be regarded as achieving a planned set of objectives, utilising the available resources in an efficient and effective manner. Ministries and Departments are supposed to develop a vision, mission, strategies, goals and action plans. Departments, in particular, have a mandate established by Acts in Parliament. Accordingly, their respective reasons for being present are well-articulated. In essence, the outcomes that they want to produce and the impacts are self-evident in their vision and mission statements. Under the prescriptions of the General Treasury, each Government institution submits its corporate plans each year. Accordingly, their outputs towards achieving the outcomes are made clear. It is often said that the private sector is the engine of growth. In fact, the public sector should be the driver of that engine with a conducive policy framework. What is needed is to strengthen the private sector by providing the required direction and facilitation by the public administrators. In such a context, the public service as a well-oiled gearbox should guide the vibrancy of the private sector. Amidst the growing dissatisfaction toward the existing performance evaluation, the need for an overall framework to relate the individual performance has been identified. Management for Development Results (MfDR) tested and proven in many public circles around the globe was seen as a suitable approach. MfDR focuses on development performance and on sustainable improvements at the country level. It also includes practical tools for strategic planning, risk management, progress monitoring, and outcome evaluation. In essence the perspective of impact or result is the central focus. In simple terms, for a desired result to be generated, there should be an outcome. For the desired outcome, there should be outputs. For desired outputs to appear, there should be a series of activities that need to be done. In highlighting quality and productivity, performance evaluation should focus on two key aspects, tasks and competencies. Tasks involve Key Result Areas (KRAs) and associated Key Performance Indicators (KPIs). Competencies involve Key Behavioural Indicators (KBIs). The intention here is not to go into details, but to highlight the novelty and necessity of the approach. Identification of KPIs will rely on the key results that an institution is deemed by the very establishment of the particular institution. In other words, its mandate articulated in respective Acts or other legislative enactments. Once the key result areas are agreed into at the strategic level, the key divisional objectives will be made clear, and those will be mentioned in the first page of the performance plan as a measure to keep the rest of the document remain aligned on check. Key Performance Areas will be derived from the divisional objectives spelt out in each performance plan. Derivation of tasks, which can range from one to many, will then depend on the key performance areas that have already been identified. KBIs on the other hand, refer to the broad aspect of competencies. According to Gary Hamel and C.K. Prahlad, “core competencies are the collective learning in the organisation, especially how to coordinate diverse production skills and integrate multiple streams of technologies”. In the public sector the demanded set of skills may vary from being generic to specific: on the whole, an individual might need to master a set of skills that are generic, but when it is referred to a position like Divisional Secretary, soft skills like public relations would be pivotal. Just as same as the need to master the skills, the need to check on the employees building their competencies and how they showcase their required skills in their respective performance can only be measured by putting up on the board what the key behavioural indicators are. Cascading effect from results to outcome, outcome to output, output to input and vice versa should be clearly identifiable in the performance appraisal system. Institutions need to rediscover their respective identities through re-reading their own establishments. Each institution needs to establish effective monitoring systems either Information Technology (IT) based or manual in order to make certain that objective measurement becomes likely and feasible. The rationale for such a line of thinking to link MfDR with Individual Performance is that it is the impacts that departments desire to create that should pass down from institutional level to interactive team level and then to individual level, which in turn produces results from individual level to spill over to interactive team level and institutional level respectively. It in fact links individual, division, department, ministerial and policy levels sequentially. 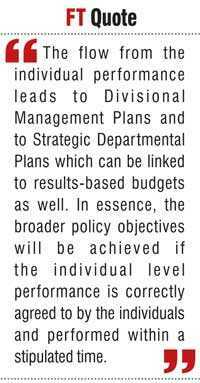 The flow from the individual performance leads to Divisional Management Plans and to Strategic Departmental Plans which can be linked to results-based budgets as well. In essence, the broader policy objectives will be achieved if the individual level performance is correctly agreed to by the individuals and performed within a stipulated time. I do not want to paint a gloomy picture. There are glimpses of achievements and loads of positives about the public service. The way the public sector promptly acted with commitment and care during the 2004 Boxing Day Tsunami is one classic example. The much improved efficiency we see in the Department of Immigration and Emigration is one recent example. Same can be said on many e-Government initiatives such as e-Pensions Scheme and e-Revenue License. The fundamental challenge is to share best practices within the public sector so that they should essentially become next practices of lethargic institutions. In doing so, we can look forward to see the engine of growth with a well-oiled gearbox with seasoned drivers moving in the right direction. That’s the path of achieving national prosperity through quality and productivity.